Laws is a talented illustrator, a gifted naturalist, and an engaging speaker. His field guide is a lovely, accessible, and amazingly comprehensive resource. Unlike other field guides it’s organized by type of creature (insects, fish, birds, plants) and then subdivided by color, with handy color-coded tabs on the right side of each page to make things easy to find (look in this section for yellow flowers, this section for blue birds). I don’t know why more guides aren’t organized this way: It’s the quickest and simplest way for someone who knows next to nothing to find their way to the most relevant pages. Laws spent six years’ worth of springs and summers in the Sierras, sketching and painting outdoors, and the intervening winters working in his home studio and doing research in museums and research libraries. He cross-checked all his sketches with top biologists and their graduate students, and then field-tested his field guide with inexperienced people (kids and adults) to iron out usability errors. The finished book contains over 3,000 watercolor paintings and is now regularly used by rangers working in the Sierras. Laws even showed a photo of the famous biologist E. O. Wilson with a copy of the Laws guide sticking out of his pocket. As an additional stimulus, Laws suggests making three kinds of notes on every page: drawings, words (descriptions), and numbers (measurements). That helps engage a wider range of your brain’s abilities and contributes to the awakening of awareness, creativity, and curiosity. But what if you don’t feel comfortable sketching, or you’re just too embarrassed because you can’t draw? You can get past that, Laws says: Stick with it, and practice twice a week or so. Within a year your brain will feel more comfortable with the sketching process and you will start to get pleasurable squirts of dopamine when you do it, making it easier and more pleasurable for you to continue practicing. I came away from his hourlong talk newly inspired to sketch and make notes about nature, not just up in the Sierras or wherever I happen to be vacationing, but also around the Bay Area and my own back yard. I also came away with a copy of his field guide, and a set of five laminated, fold-out mini-guides to Bay Area wildlife that he also designed. And, I leave you with a suggestion he made at the beginning of his talk: Support your local bookstore. By all means, use Amazon to browse, search, and read reviews for books. But once you find a book you want, instead of ordering it from Amazon, go down to your local bookstore and ask them to order the book for you. It’ll take longer, it’ll be slightly less convenient, it will probably cost a bit more — but you will gain immensely from supporting your local bookseller and getting to know them a bit. Anyway, it’s certain that Jeff Bezos doesn’t need any more money, but local bookstores do, and events like this one are a shining example of why we all benefit when they continue to exist and thrive. When I crossed the road I had been on the trail for about a mile and a half, starting with over 700 stairs straight up out of Mill Valley into the forest above the town. I asked the ranger directing cars which way to the Dipsea Trail, and he told me to cross the parking lot and turn right. But a few minutes later, I found myself at the gateway to Muir Woods, tourists milling around and looking up at the tall trees. “This can’t be right,” I thought to myself, so I asked a second ranger. 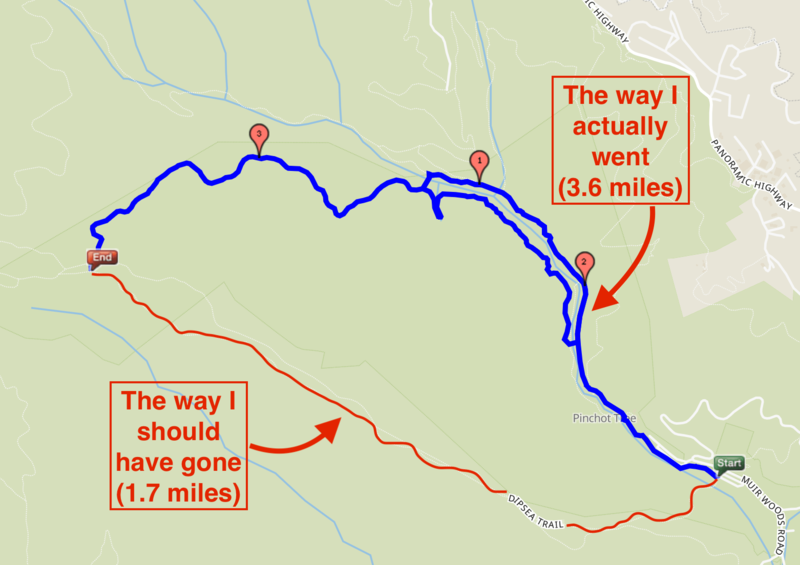 She said I could go back the way I came, or I could proceed through Muir Woods, turn left onto the Ben Johnson trail, and get back on the Dipsea from there. The second route was shorter, she said, but I’d have to buy a ticket. After waffling for a minute I decided to continue through. I was on the third leg of the Dolphin Club’s Escape From Alcatraz Triathlon, and so far that morning I’d already swum from Alcatraz to Aquatic Park (58 minutes), bike to Mill Valley (about an hour), and run as far as Muir Woods. I figured I needed to conserve energy and take the fastest route. So I paid the $10 entry fee in cash, said no thanks to the brochure the ticket-seller offered me, and jogged into the woods, weaving around families and slow-moving couples as I passed by one monumental tree after another. Entering Cathedral Grove, I noticed the sign requesting respectful quiet, but as it didn’t say anything about speed, I kept up my steady jogging pace. A sign with a map on it indicated that the Ben Johnson trail would be a left turn after Bridge 4, so when I reached the bridge, I crossed over it and started up the path, excusing myself politely to pass a largish family group that was also ascending. I continued jogging along the trail, marveling at the cool air, the light, the magnificent trees and roots and stumps all around. Earlier, as I was walking up the stairs that started the trail’s steep ascent out of Mill Valley’s Old Mill Park, I had been glancing at the plaques embedded into the concrete risers. Most of them paid tribute to loved ones, or memorialized families, but one caught my eye. “Enjoy this wonderful moment,” the plaque said, which was somewhat amusing to consider from the point of view of a person suffering up a brutally steep climb equivalent to the height of a 55-story skyscraper. But it also reminded me of Buddhist teacher Thich Nhat Hanh, whose writings repeatedly remind us to recognize the present moment, to enjoy this wonderful moment. So I was savoring that saying, and the awareness of the wonderful moment, as I jogged through the ancient trees, the filtered light, the ferns and dirt and rocks of the trail above Muir Woods. And then I noticed the trail wasn’t connecting with the Dipsea. In fact, it was curving back down to rejoin the lower, level path through Muir Woods. Dammit! I had jogged back almost to the entrance of the park! Clearly, I realized, I’d taken a wrong turn — again. Rather than head back out and start over, I decided to take a second jog through Cathedral Grove and turn the correct way this time. Looking at another sign, it was clear that I needed to turn to the right, not left, immediately after crossing Bridge 4, so that’s what I did on my second time across. And as I made my second ascent from Bridge 4 I realized where I had gone wrong the first time: In my rush to pass the large extended family on the trail, I had jogged past the turnoff to the Ben Johnson Trail. The people I was passing had probably stepped aside onto the trail I actually wanted to take in order to let me go by on the wrong path. A lesson in mindfulness: You can enjoy this wonderful moment, but don’t forget to look for the trail signs. I climbed, more slowly now, noticing the beginnings of cramping in my quadriceps, up the steep Ben Johnson Trail towards (signs indicated) the Stapleveldt Trail. I passed many fewer people now, most of them going the opposite direction. “You run on these trails much?” one person asked me, clearly hoping for directions. “This is my first time!” I answered, just as befuddled as he. Eventually I took my phone out and switched it out of battery-saver mode so I could use the map. I double-checked my course and confirmed that I was headed the right way, slowly but surely. About an hour after talking to those two rangers, I finally emerged onto the Dipsea, still climbing, but definitely in the right place. A short while later I reached the aid station called “Cardiac,” which at 1,360 feet above sea level is the trail’s high point. I had reached the four-mile marker of the official course in about two hours, with my diversion adding (I would learn later) about 2 extra miles. I wasn’t sure, but it seemed like that mistake might cost me the ability to finish the race. Still, I knew I could keep going for now. A volunteer I knew from the South End offered me mini-candy bars from a cooler full of ice, I drank a couple cups of cool water, and then I jogged along. Fortunately, after Cardiac the trail stretched mostly downward toward the ocean and Stinson Beach. It turned out that jogging helped the cramps go away; it was only on my slow climbs that my thighs really started acting up. Three miles later I was at sea level again, eating the peanut butter and jelly sandwich I’d sent ahead and snacking on red potatoes dipped in salt (a Dolphin Club triathlon tradition, one of the volunteers told me). I checked my watch: It was about 1:30pm, or four and a half hours after I started the event by jumping into the water off Alcatraz. After drinking some more water, I decided not to quit. More accurately, I decided to just keep going. So I headed back up the Dipsea. The return trail was not easy. A long, hot ascent led up through the brush away from Stinson, exposed to the sun much of the time. While the day wasn’t terribly hot, I was. And my legs were exhausted, although fortunately the cramping problem mostly abated. I walked, rather than ran, on this long uphill. When I reached stairs, I trudged, rather than walked. But eventually I hit Cardiac again, and I knew that the rest would be downhill — more or less. A dip, followed by another rise of a few hundred feet, still lay in front of me, but it was already about 2:15 p.m. and I knew I could manage the rest of the route in an hour or so. The end was in sight. I was able to jog on the downhill stretches, and maintained a good walking pace when the trail angled uphill. It was only when I hit the many stairs leading back down to Mill Valley that I truly slowed down again. Over 700 stairs down, and my legs were tired, sore, and absolutely unhappy about being made to lower my body down, step after step. I went slowly and carefully down the steps until, at last, I stepped off the last rise — and there, across the street, I could see Curtis, my son, waiting for me. He waved and ran up to me, and I jogged with him to the finish line. It was 3:35 p.m. when I finished the race, for a total official time of 6 hours and 35 minutes. I learned later that I’d placed 41st out of a field of 49 finishers. Could have been worse, but not bad given that I ran a total of 16 miles instead of 14. I ate a chocolate chip cookie and guzzled a chocolate milk, and Karen and Curtis took me home. This was the longest endurance event — the longest period of sustained heavy physical effort — that I’ve ever done. And while it was exhausting, it was also incredibly beautiful and exhilarating. I described it as mainlining the best that the Bay Area has to offer in one six-hour period: Alcatraz, the view of San Francisco from the Bay, Aquatic Park, the trail leading up to (and looking out on) the Golden Gate Bridge, the Bridge itself, Sausalito’s beautiful marshland and downtown waterfront, Mill Valley’s woodsy wealthy houses. And then the trail itself: Old-growth redwoods, rain forest, fragrant bay laurel forest, sun-warmed manzanita chaparral smelling of sage and lavender. Views of the Bay, distant city skyline, the spreading expanse of the Pacific Ocean with its white lines of surf. And all along, at every aid station, the help and encouragement of the volunteers. I’m not sure I’d exactly recommend this course to tourists (and anyway the event is only open to members of the Dolphin Club and South End Rowing Club), but it was one of the best days I’d ever spent outdoors in San Francisco, and I’m glad I did it. The high lasted for days and the sights (and smells and tastes and feelings) will live in my memory for a very long time. I could barely even aim my phone right to take this picture. Also, I took this a minute after stopping. What my friend posted was just her venting. People do that, among friends, after bad experiences. They make outrageous generalizations and say things that aren’t literally true, because they’ve been hurt or they’re frustrated and they just need to blow off some steam. An understanding friend knows how to listen to that and take it for what it really is. But Facebook exposes that venting to the world, or at least to a wider circle, where it becomes subject to analysis, interpretation, criticism, debate. Facebook wants to keep you on the site. The more emotionally engaged you are, the more ads they can show you. So it’s designed to make you engaged and keep you that way. Anger and outrage are among the easiest “engaging” emotions to provoke. All Facebook has to do is show you some emotionally charged content (that may have been someone venting) and encourage you to respond to it. So if you are easily outraged (as the 17 y.o. is) and you want to make Mark Zuckerberg even richer than he already is, by all means, spend more time on Facebook. You’ll spend a lot more time being angry and upset, though. I was under the weather the entire first week of July, so I spent July 4 in bed, reading this book by Mitch Horowitz. 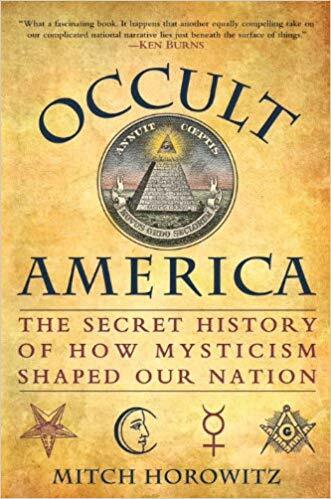 Published in 2009, Occult America is an entertaining survey of a variety of “occult” religious trends that blossomed over three centuries of American history. Horowitz starts his account with the arrival of the Shakers, a somewhat controversial choice since the Shakers weren’t especially “occult,” even by Horowitz’s very broad definition: A belief in a mysterious, hidden world that controls what happens in the visible world, and which can be used to understand or control the visible world in ways that aren’t accessible to most of us. But it’s a good point to start the discussion of enthusiastic, sometimes radical outbreaks of charismatic, contagious spiritualism. In subsequent chapters, Horowitz covers 18th-century spiritualism and Freemasonry; 19th-century Theosophy and Mormonism; the self-reliant spiritualism of Booker T. Washington and Marcus Garvey; African-American hoodoo; Wicca, Ouija boards, tarot, and mail-order spiritual supply houses; Manly P. Hall; and the rise of the New Age.